In the summer of 2008 western governments professed to be surprised by the outbreak of armed conflict in South Ossetia and the resulting short war↑between Russia and Georgia. Yet many observers had warned for months of a resort to arms either in South Ossetia or in Abkhazia. In the summer of 2008 western governments professed to be surprised by the outbreak of armed conflict in South Ossetia and the resulting short war↑between Russia and Georgia. Yet many observers had warned for months of a resort to arms either in South Ossetia or in Abkhazia. The failure was not of warning but of policy response. Today there are warning signs of renewed conflict in another part of the Caucasus: between Armenia and Azerbaijan over Nagorno Karabakh↑. The ceasefire in place since 1994 is increasingly fragile: serious violations are routine, and a major arms race is under way. Above all, expectations of another war on both sides fuel momentum toward it. Observers of the region in recent months have warned about the danger. The parties to the dispute are unwilling to reverse the trend. Outside powers can either wait until another of the ill-named ‘frozen conflicts↑’ goes hot or they can transform their currently stalled mediation efforts. A significant armed conflict over Karabakh could be much more serious than the brief 2008 war, in part because the two sides are more evenly matched and in part because of the proximity – and vulnerability – of major oil and gas pipelines. Thus, another Karabakh war could touch Europeans and Americans at one of their most neuralgic points, the ‘price at the pump’. Aware of the increasing worry among informed observers in Washington, I took the opportunity of a recent international conference in the Armenian capital Yerevan to visit Karabakh. Two caveats require emphasis. First, the trip was of a personal nature and in no way sanctioned by the United States Government, despite my former official status in the State and Defense Departments. Second, my visit, although facilitated by Armenian and Karabakh authorities, implies no partisanship on my part. My earlier writings demonstrate my neutrality on the dispute, other than opposition to renewed war. While I did not have authorisation from Azerbaijan, which of course claims Karabakh as its sovereign territory, I have affirmed to its officials both my neutrality and my willingness to make a parallel visit to their side. In short, I visited Karabakh to look, listen and learn because of my concern about the danger of another war. Three days in Karabakh deepened that concern, considerably. Through the helpful intervention of some authorities in Washington and Yerevan, I was able to visit units of the Karabakh army, to travel through the restricted zone around the ghost town of Aghdam (a former and potential battlefield), and even to visit the actual front trench↑along the ‘line of contact’ facing similar Azerbaijani trenches less than two hundred meters distant. My parallel conversations with Karabakh officials and with seventeen representatives of civil society focused on security issues and the potential for renewed war. While much of what I saw from the ground level was familiar to me from overhead imagery, it was not the trenches, tank traps, mine fields and artillery positions which deepened my concern, but the conversations with both soldiers and civilians. Taking this experience in conjunction with monitoring of the Karabakh dispute since 1991 in a variety of official and non-official capacities, I perceive five interlocking tendencies which could produce another war. First, the ceasefire of 1994 has not ameliorated the dispute, but rather deepened the estrangement between the parties. The result is not a ‘no-war, no-peace’, but rather a pre-war environment. With the ethnic cleansing of the previous Azerbaijani population of Karabakh and the surrounding occupied territories, plus the almost total migration of the respective ethnic communities from Armenia and Azerbaijan, there is almost no non-governmental contact between the two nations. Adversarial propaganda on both sides accentuates stereotypes and hatreds. Karabakh itself, which was genuinely multi-ethnic during the Soviet period, is now entirely Armenian but with much of the territory and communities formerly occupied by Azerbaijanis simply empty. 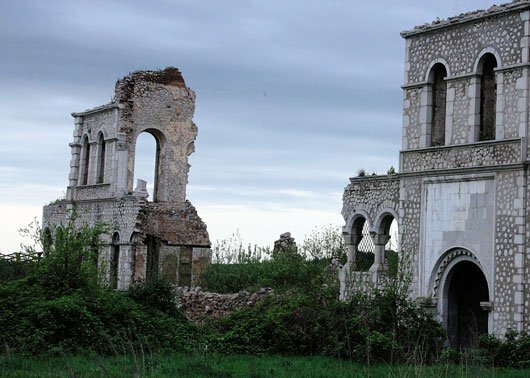 On the edge of Karabakh are the ruins of Aghdam, once a thriving community of forty thousand but today a vast expanse of gutted former dwellings. While some of the surrounding land is cultivated, the Armenian farmers are purely seasonal. Throughout the region is the stark evidence of former inhabitants now living as refugees in Azerbaijan. Often, only their cemeteries remain more or less intact. The younger people with whom I spoke have little or no active memory of an Azerbaijani, and then only in a wartime context. This physical estrangement has resulted in a tendency to dehumanize the ‘other,’ a pervasive quality in statements from both sides. Second, the mediation of the so-called Minsk Group↑co-chairs (Russia, France, the United States) of the Organization for Security and Cooperation in Europe is not, unfortunately, reducing the momentum toward war. The diplomats involved have worked diligently on both the substance and technical issues of a settlement – much of which is largely complete. However, after two decades the Minsk Group has achieved no visible progress to soothe popular frustrations on both sides. This lack persuades many, especially in Azerbaijan, that diplomacy is not the path to a successful ‘resolution’ of the conflict. The decades of mediation have produced popular cynicism rather than hope about a peaceful outcome. 'The truth is that international mediation has enabled authorities in Baku and Yerevan to avoid their core responsibility to inform and educate their respective populations about the compromises required for a peace settlement. The underlying diplomatic reality is that mediators do not negotiate; mediators mediate. The parties to the conflict could negotiate, but have failed to do so in a serious way while using the Minsk Group as cover. Both governments routinely assert their own readiness for progress and place the entire onus for failure on the other. The truth is that international mediation has enabled authorities in Baku and Yerevan to avoid their core responsibility to inform and educate their respective populations about the compromises required for a peace settlement. Both societies have maximalist expectations for the dispute, expectations which could only be achieved for either side through a successful large-scale war. Some senior observers have speculated that removing the Minsk Group mediators for at least a time might actually improve diplomatic prospects. By ‘parties’ I mean only the republics of Armenia and Azerbaijan. I do not refer to the self-proclaimed and unrecognised ‘Nagorno Karabakh Republic’ (also known as Artsakh). Although I conducted friendly discussions with officials of this entity, in my view Karabakh is essentially a prospective province of Armenia and not a separate or self-standing party to the conflict. For example, in the 1991-94 fighting the armed forces of the Armenian Republic participated directly on a large scale and would again in a new war. While there is genuine local governance in Karabakh and broad popular support for its semi-autonomous army, the largely agricultural economy relies on massive subsidies from Yerevan and from the Armenian diaspora (and is critically dependent on Iran for fuel). It is certainly true that, over the past twenty years, Karabakh has often been the tale that wagged the political dog in Yerevan, sometimes violently. Despite these internal tensions, there is only one Armenian party to the dispute. Karabakh, with fewer than its claimed population of 140,000, deploys (depending on your source) something like 300 main battle tanks, which may be the highest per capita armour ratio on earth. Third, a very serious arms race is underway, fueled on the Azerbaijani side by that country’s substantial oil and gas revenues and on the Armenian side by transfers from Russia. The scale of this arms race is massive, while the content is modern and highly lethal. To give a single illustration, Karabakh, with fewer than its claimed population of 140,000, deploys (depending on your source) something like 300 main battle tanks, which may be the highest per capita armour ratio on earth. The basic impetus of the arms race is to allow Azerbaijan to acquire by force what it had lost at the time of the 1994 ceasefire or, at least, to encourage Armenian concessions by the credible threat of war. As the Azerbaijani defence budget is now comparable to, if not larger than, the entire Armenian budget, the spending race clearly favors Baku. However, Yerevan obtains Russia-made armaments at rates which are, at least, concessional. As is usual in such circumstances, the programs and policies of defense ministries leave those of diplomatic institutions in the shadow. Thus far, the arms race has not contributed to political flexibility by either side; rather it is contributing to dangerous mutual fears of pre-emption. Fourth, ceasefire violations along the line of contact by both sides are now so routine as not even to be regularly reported abroad. The reciprocal sniping, often targeted on civilian farmers, is different in scale and lethality from the ceasefire violations of only a few years ago. Today there is not a quasi-peace but a quasi-war. This is something which can get out of hand in a hurry, especially as there exist no confidence-building measures between the two sides such as direct communications or notifications of maneuvers. The small OSCE observer mission has an impossible task, given the length of the line of contact and the often formidable terrain, let alone the unwillingness of both sides to dampen tensions. It bears noting that this kind of sniping preceded the August 2008 war over South Ossetia. Fifth, the most worrisome element is the growing expectation on both sides that a renewed war may not only be inevitable but even be desirable. No-one thinks a new war would be a cakewalk – memories of the human cost of the 1991-94 fighting are too fresh – but many imagine war would ‘settle’ the dispute on favorable terms or at least break free from the diplomatic impasse. The danger is perhaps not so much a deliberate and rational resort to war, but rather a developing confrontation in which neither side has the political courage openly to back away from conflict. Each side condescends to its opponent, both politically and militarily. Azerbaijanis argue that the country’s massive military spending has altered the previous balance of forces in its favour and, hence, a short if bloody campaign could restore Azerbaijani sovereignty in Karabakh and the national honor. The Armenians believe that Azerbaijani money does not equate to military skill and that Karabakh (plus, of course, Republic of Armenia) forces not only can withstand an Azerbaijani assault but could turn the tables with maneuver warfare aimed to expand Karabakh’s current frontiers, or even to take the fighting as far as Baku. Clearly, both sides cannot be correct in their evaluations, but both can be wrong. I believe both are wrong if only because of the probable character of a renewed war. What form would a new war take? Another Karabakh war would not repeat the one of 1991-94. That conflict was a series of largely infantry campaigns with some armored, artillery and air support in a multi-ethnic demographic. In the intervening years, Karabakh has been systematically transformed into a fortress, combining its natural mountainous topography with thoroughly-prepared echeloned defenses in depth. The strategy is to employ fortifications and firepower, in conjunction with space and topography, to inflict casualties and buy time. I can testify that the Aghdam region is a killing field in waiting. Thus the next Karabakh war will be a siege. Throughout history, sieges have been notorious for brutality, bloodshed and cost to civilian populations. A siege campaign has two components, usually sequential: bombardment and assault (or engagement). The two countries are preparing extensively for a major reciprocal bombardment component, acquiring long-range artillery, multi-launch rocket systems, large munitions stockpiles and surveillance drones. However, no decision could be achieved in such a battle merely by bombarding each other’s trenches. It is quite clear that both parties intend to target civilian infrastructure and population areas almost from the outset. Indeed, one source in Yerevan said openly that Armenian targeting would be ‘counter-value’. The most valuable and sensitive targets on both sides are well beyond Karabakh in the respective motherlands, including oil and gas pipelines and a nuclear power station, and are vulnerable to strike aircraft. Unless outside pressure brings a ceasefire quickly, the battle will move to a non-static engagement phase. Both sides have large mobile forces, complemented by drones and other high-tech equipment. Armenia should not underestimate the improvement in Azerbaijan’s order of battle and combat skills. Even if somewhat ragged in operational art, a large and well-equipped force willing to accept losses can achieve a great deal on the battlefield. Likewise, Azerbaijan should not overestimate its newly-acquired force structure, as Armenia has worked hard to maintain the fighting edge of its smaller army and will take full benefit of its advantages of terrain, fortification and depth. With a little misjudgment on either side, let alone both, an all-arms war could be underway before global media had located Karabakh on the map. Informed outside observers believe the balance favours the defence, but potentially at an exorbitant cost. It is beyond imagination that Russia and Turkey would come to blows themselves (indeed, relations between Moscow and Ankara in most respects are fairly good), but a proxy war fed and supported by regional great powers can assume proportions far beyond the interests of the combatants themselves. Indeed, the combatants would be highly motivated to try to engage their respective patron states, each with a common border with the adversary, if only to threaten the adversary’s strategic rear. The consequences are unpredictable and dangerous. A renewed war between Armenia and Azerbaijan may not be inevitable, and is probably not imminent. However, the environment is significantly more dangerous than only a few years ago, with growing momentum toward open conflict. Unless deflected or reversed, that momentum will reach its logical conclusion. The parties are not behaving responsibly, so someone else should. Over the past twenty years, American, French and Russian administrations have attempted at various times to achieve a diplomatic breakthrough on Karabakh by engaging the parties at top political levels, most recently at the summit hosted by President Medvedev in Kazan in June 2011. Sadly, all these presidential initiatives failed, because political leaders in Baku and Yerevan were unwilling or unable to muster the political capital (or courage) to accept the initiatives. Both governments have known for years what a settlement must look like; the Minsk Group mediators have worked this out in considerable detail. Neither government is willing to say so to its own people because both must accept major compromises. The mediators have thus far engaged only governments, not populations. With presidential elections this year in all the Minsk Group co-chair countries, it would be hard to generate initiatives on a supposedly ‘frozen conflict.’ (Whoever authored that fallacious phrase has much to answer for!) Nonetheless, the situation demands high-level political action by outside powers – and even some old-fashioned great-power collusion – to prevent a pair of small countries endangering regional and international interests. Turkey now must be part of the solution. Turkey is not only a Caucasian great power and neighbour to both Armenia and Azerbaijan; it is a vital participant in all regional issues with an increasingly assertive political and security posture. A leading Turkish role should be encouraged and welcomed. Above all, complacency and delay are dangerous. Events in the Caucasus have their own laws and logic, and they wait not on the American, French or Russian political calendars. 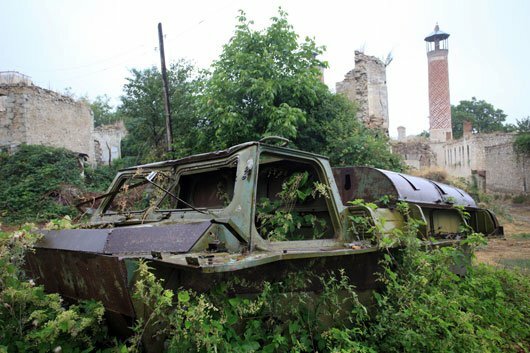 The August 2008 war arguably made all involved worse off, even those in Abkhazia and South Ossetia who welcomed their formal separation from Georgian sovereignty. That post-war environment looks to be truly frozen for many years to come. While some – perhaps many – Armenians and Azerbaijanis imagine that another war would resolve things to their satisfaction, any victory gained would almost certainly be Pyrrhic for either side. What is needed is an initiative to achieve a final settlement of the Karabakh issue along lines already worked out within the Minsk Group rather than continuing to mediate it. This will require major cooperation among the outside powers to encourage if not actually impose a treaty-based settlement involving painful compromises by both parties. Peacekeeping and reconstruction will be vital elements of a settlement. In large measure, the outside powers need to supply the political courage lacking by the parties and to speak truth to their respective populations. The core truth is that two decades ago there was a war with consequences – not perhaps ‘right,’ ‘just’ or ‘fair’ – but consequences whose acceptance is far better than another war. It is time for outside powers to serve their own interests by moving beyond mediation. This is a tall order in the present international climate, but managing the Karabakh dispute into a third decade is no solution; neither is waiting for a new war.